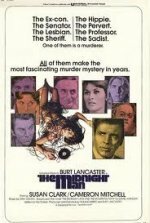 Burt Lancaster stars as a former cop, jailed for the murder of his wife's lover, who investigates another murder on the university campus where he now works as a janitor. Set in South Carolina, this is never more than a routine murder mystery; Lancaster later admitted he made it as a favour to his longtime buddy and partner, Roland Kibbee, who badly needed the money and got a co-writer and co-director credit. Susan Clark, who appeared alongside Burt in the earlier Valdez Is Coming and the subsequent Airport 1975, plays Lancaster's parole officer and romantic interest.